Welcome back, everyone, to another week of Science Fiction Fantasy Saturday. It's been an extremely long while since I last posted a snippet. With a new year, I'm going to try and make a run at it again. 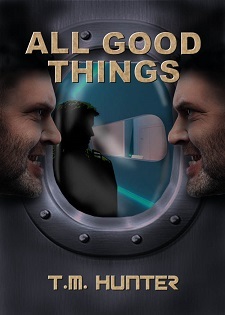 For those who didn't already know, my new Aston West "series" novel, All Good Things, is now available for pre-order over at Amazon. A new ship. A new love. A new life. An old nemesis could end it all. Space pirate Aston West never truly came to grips with the death of his friend, Leah Jordan. He’s tried to move on, falling in love with his best friend, Rione Sc’lari. But the memories of Leah’s murder at the hands of twin brothers Lars and Elijah Cassus still linger, gnawing at Aston’s soul as he blames himself for her death. Even though he exacted fatal vengeance on Lars, Elijah has promised revenge for his brother’s demise. Elijah finally reveals himself, and Aston believes his life is over. But rather than carry out his prior threat, Elijah, possessing a new miracle drug, promises to bring Leah back to life if Aston goes along with his latest diabolical plan. Will Aston risk his newfound love and join forces with the ultimate evil, just to find absolution? We stepped toward the doors to the landing pad, which opened a moment before something clanged, echoing around us. I peered out at our ship, but saw nothing out of the ordinary. Six containers were all lined up neatly underneath the ship. A yard technician was driving his tracked vehicle toward the ship, dragging along three more containers behind it as columns of smoke bellowed out of its vertical exhaust shafts. Another vehicle with huge wheels grabbed the first container with some sort of claw-like attachment on its front. Then, the second yard technician moved rapidly from the container drop-off point over to the first of the twelve bay loading platforms that were resting on the ground. Dropping it off, he went back for the next container while the lift pad began a quick trip up into its respective cargo bay. The tracked vehicle dropped off its load, and sped off toward its final load beyond my line of sight. “Think it could have been the cargo containers?” Rione asked. Before we had a chance to make a move, a woman’s scream filled the foyer. Hope you enjoyed it! If so, pick up a copy of All Good Things from the link above. And of course, be sure to check out all of the fabulous SFFS snippets through the link at the top of this post.